A number of influential American thinkers of the late eighteenth and early to mid-nineteenth centuries called for the creation of an American style of architecture. They hoped for buildings that would suit American needs, use native materials, and reflect the American character. Government buildings, as the physical manifestation of our republic, were of special interest. 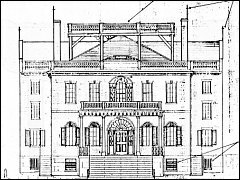 The Federal style of architecture, employed in many of the public structures erected between 1776 and 1820 can be seen as an Americanization of the classical architecture which preceeded it in Europe and the colonies.